If he ever gives a TED talk, Jeremy Sanford may have to come up with a better name for the protein he's been studying, which appears to play an important role in driving the proliferation and metastasis of cancer cells. For now, it's known as IGF2BP3, which stands for "insulin-like growth factor 2 mRNA binding protein 3." IGF2BP3 is normally active in fetal tissue and undetectable in most adult tissue. But production of the protein is reactivated in many types of aggressive cancer, and it is associated with poor prognosis in both solid tumors and leukemias. New findings from Sanford's lab at UC Santa Cruz, where he is an associate professor of molecular, cell, and developmental biology, point toward a possible mechanism by which this protein drives metastasis. 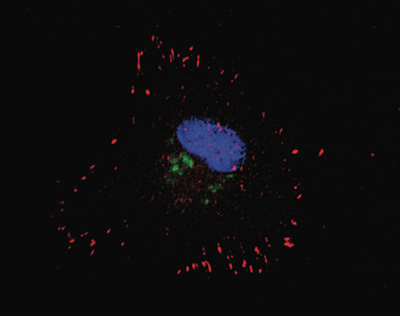 In a study published May 19 in Cell Reports, Sanford and his collaborators identified an extensive malignancy-associated gene expression circuit regulated by IGF2BP3 in pancreatic cancer cells. "We haven't nailed down the details of the interactions, but it suggests a mechanism for how IGF2BP3 could drive metastasis by influencing the expression of genes involved in cancer biology," Sanford said. Gene expression involves several steps, and regulation can occur at different steps in the process. When a protein-coding gene is turned on, its DNA sequence gets copied into a messenger RNA molecule, which is then translated into a protein that carries out a specific function. Many regulatory factors control which genes get transcribed into messenger RNA and when. Less well understood are RNA binding proteins, such as IGF2BP3, which interact with the messenger RNA itself to regulate gene expression after transcription has occurred. 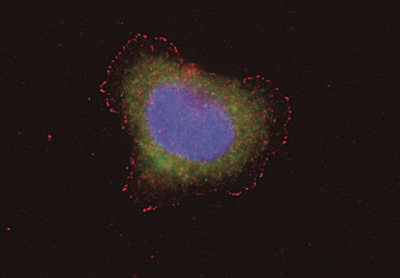 In the new study, Sanford's team identified a set of 164 messenger RNA targets regulated by IGF2BP3 in pancreatic cancer cells. They found that most of the targeted RNAs encode proteins that have some role in cancer biology, such as cell migration, proliferation, and adhesion. IGF2BP3 had different effects on different targets, increasing the expression of some proteins and decreasing others. This dual activity may depend on how the protein interacts with an important gene-silencing pathway mediated by short pieces of RNA called microRNAs. MicroRNAs can help silence gene expression by binding to messenger RNA as part of a complex known as the RNA-induced silencing complex (RISC). "It's basically a little molecular machine with a guidance system made of microRNA, and it silences genes by blocking translation of the messenger RNA," Sanford said. "When we mapped the positions where IGF2BP3 interacts, we noticed that many of them overlap with binding sites for RISC." In some cases, IGF2BP3 may compete with microRNAs for binding sites on the messenger RNA, thereby interfering with the silencing complex. In other cases, IGF2BP3 appears to enhance the function of the RISC complex. "We don't know the exact mechanism of how the IGF2BP3 protein interacts with the RISC complex, but it gives us a lot to investigate in terms of this interesting network of interactions," Sanford said. "It also suggests that therapeutic approaches to interfere with the interactions between IGF2BP3 and its targets might be effective to decrease the aggressiveness of certain tumors." The first author of the paper is Hanane Ennajdaoui, a postdoctoral researcher in Sanford's lab at UC Santa Cruz. Other coauthors include Jonathan Howard, Timothy Sterne-Weiler, Fereshteh Jahanbani, Doyle Coyne, Marija Dargyte, Sol Katzman, Jolene Draper, Andrew Wallace, Oscar Cazarez, and Lindsay Hinck at UC Santa Cruz; Philip Uren and Andrew Smith at the University of Southern California; Suzanne Burns, Mei Qiao, and Luiz Penalva at the University of Texas Health Science Center, San Antonio; Masoud Toloue at Bioo Scientific Corporation; and Benjamin Blencowe at the University of Toronto. This work was funded through grants from the National Institutes of Health, Santa Cruz Cancer Benefit Group, UC Cancer Research Coordinating Committee, and the California Institute for Regenerative Medicine.